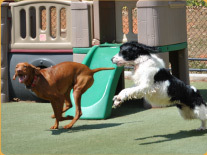 Dogs love to run, jump and play, and that's just what we encourage here in doggie daycare at Pawtropolis. 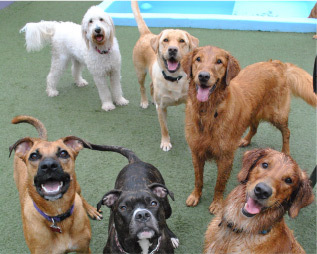 Dogs get to spend their day in playgroups, rotating between indoor and outdoor play areas. Playgroups will be formed with dogs of similar sizes and temperaments. When you drop off your dog, their furry friends immediately greet them, ready for a long day of play. 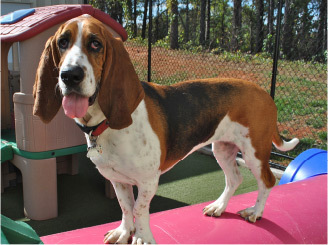 The day is spent playing on the playground equipment in Central Bark, swimming in the kiddy pools, or just lounging around in the Hound Playground. Nap time and lunchtime is available for those dogs whose parents request it. By the time parents arrive to pick-up their dogs from doggie daycare, they’ll find their dog tired, hungry and ready to go bed. This is a dream come true for many an equally tired pet owner. Ready to enroll your pet? Never heard of Doggie Daycare? The benefits of allowing your dog to attend doggie daycare are astounding. For young dogs it teaches them invaluable social skills that will help them learn how to properly meet and interact with a variety of other dogs. It also helps young puppies with their potty training because we keep them on a very routine potty schedule. See an extended explanation of dogs in packs. Very hyper dogs are given a proper outlet for all of that energy. That way, you can simply relax and enjoy their company at home and not have a dog demanding attention and exercise. It’s as if we offer the “Pawtropolis Weight Loss Plan.” Not really, but we've noticed dogs needing to shed a few pounds can do so by playing in the playgroups all day. Meet Molly! A cute collie mix, who needs a good home.